They caused controversy with their 15-year age gap when they enjoyed a brief romance in late 2011. 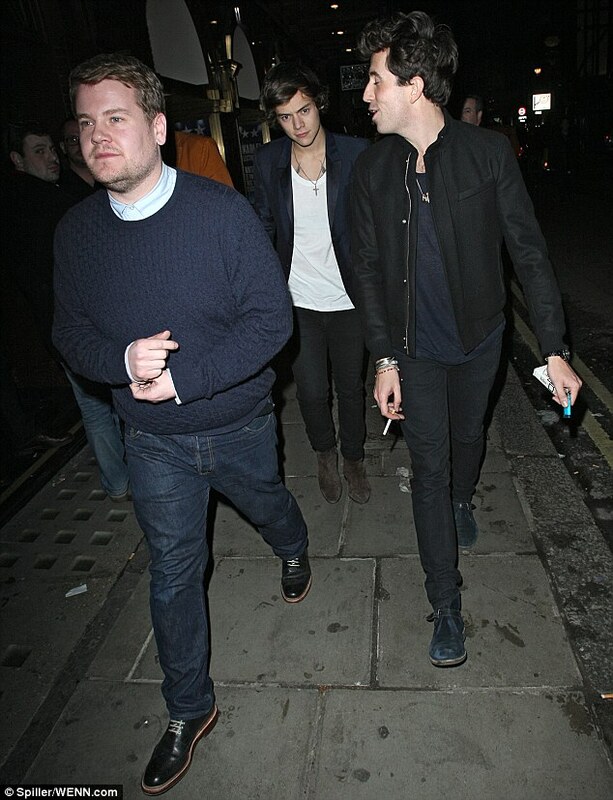 But it would seem Harry Styles and Caroline Flack are still very much the best of friends after they enjoyed a night out celebrating the One Direction singer's 19th birthday on Thursday evening. The 33-year-old TV presenter was spotted leaving London's exclusive Groucho Club after a night of celebrations with her former toyboy and a group of showbiz pals. Looking a little bleary-eyed as she emerged from the nightspot, the Xtra Factor host wrapped up in a cosy chocolate brown faux fur coat while making sure to parade her prized pins in a black lace trim minidress and monochrome block heels. And in spite of parting ways from her teenage lover over a year ago, it would appear the brunette star was still concerned with looking her very best for her evening out. Birthday boy Harry looked his typically dapper self as he left the central London venue, showing off a hint of his chest tattoo in a low cut white T-shirt, which he teamed with a navy blazer and black skinny jeans. Grinning from ear-to-ear, the teenage heartthrob seemed pleased as punch with the turnout for his night of celebrations. Prior to heading to the Groucho Club, Harry enjoyed a meal at La Bodega Negra with best pals DJ Nick Grimshaw, 28, and actor James Corden, 34. 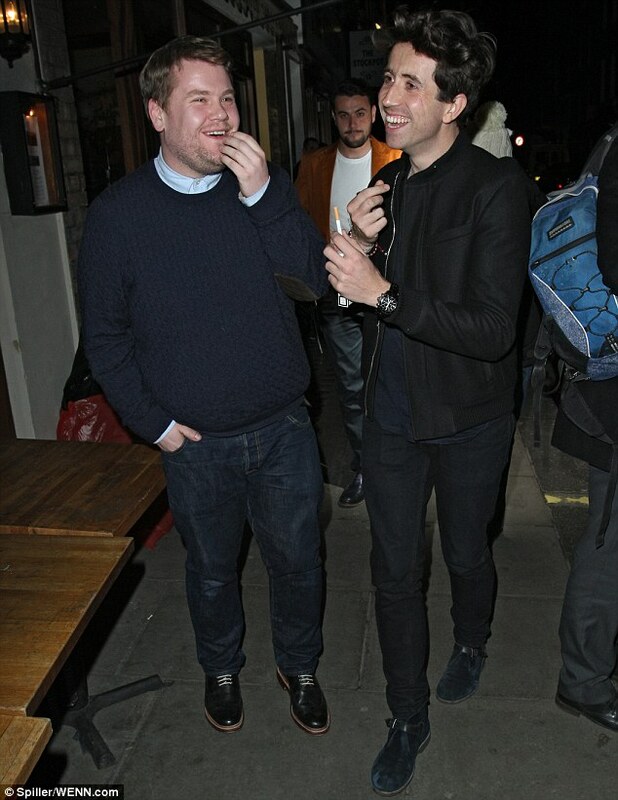 Chatting away and sharing a joke as they made their way down the street, the trio of showbiz chums appeared to be in great spirits as they toasted the star's last birthday as a teenager. 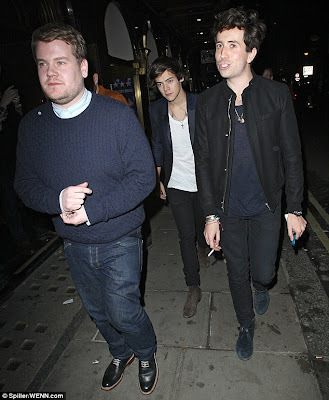 Although he was certainly in a sprightly mood as he arrived at the Groucho Club, Harry kept his head down as he left, suggesting he may have enjoyed one or two birthday beverages with his friends, before continuing the celebrations at Base nightclub until 3.20am. Also spotting leaving the exclusive nightspot after Harry's party were presenter Zara Martin and Hollywood actor Jason Statham, who didn't seem to be in a great mood as he departed the club. But apparently absent from the celebrations were the singer's One Direction bandmates, Louis Tomlinson, Zayn Malik, Liam Payne and Niall Horan. It would seem Harry was feeling a little sorry for himself as he awoke on Friday morning, bemoaning the fact that it was his last birthday as a teenager. Caroline and Harry enjoyed a three-month romance in late 2011, when she was 32 and he was just 17. And although the relationship attracted widespread criticism, the TV presenter - who was formerly linked to Prince Harry - publicly defended the pairing. In an interview with Now magazine at the time, she said: 'I keep thinking, "What have I done wrong?" But I haven’t done anything wrong. What’s hard for me to get my head around is people saying it’s disgusting. I don’t think it is. 'I feel like I shouldn’t have to worry about what I do. But it’s a social thing that people aren’t accepting of big age gaps. 'Some people tend to see the negative immediately and that's what I find really strange.